Did you work for other boardgames before or only comic strips? 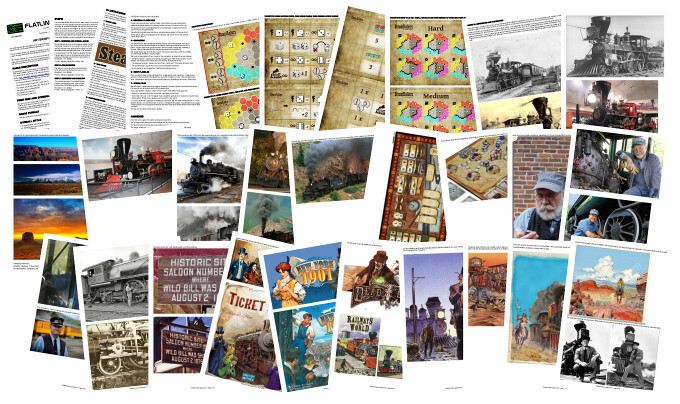 No, I usually work on comic books, and do various commissions, from wedding cards to car posters, but never had the chance to work on a boardgame. 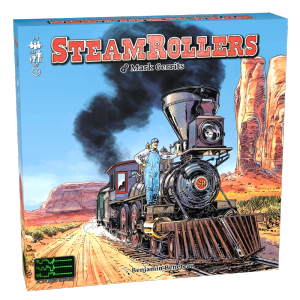 As a casual boardgaming fan, I always gave much attention to their art, hoping that one day I could make it, and SteamRollers made it possible. Did you play the game before starting work on the art? Of course: it was a critical necessity for me to grasp the spirit of the game, before trying to put drawings on it. 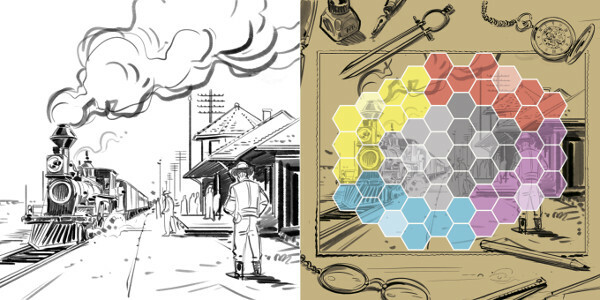 The artwork is an interface for a logical gaming process I had to fully understand first. It needs to serve the understanding of the game as much as making it attractive. 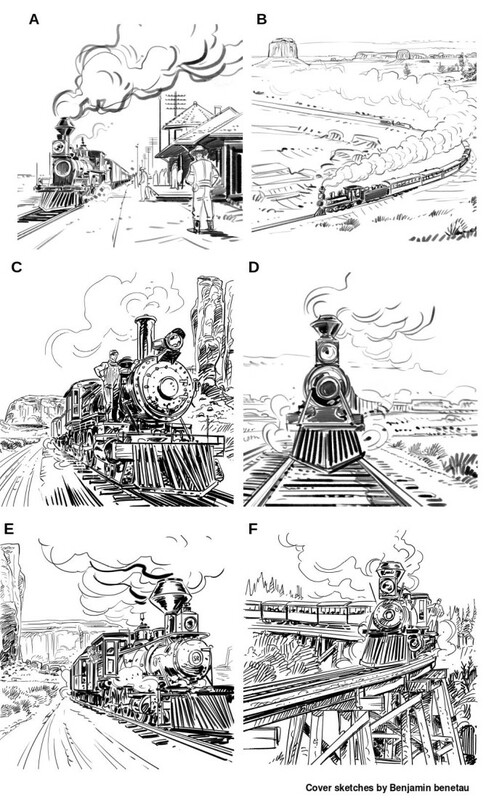 What was your process for creating the SteamRollers art? A long one. At the beginning I thought it would be a relatively short run, based on my experience on diverse commissions, but I quickly discovered it would take me much more time, as I was lacking the experience on this kind of artwork. The main difficulty is the amount of constraints for the short amount of images : every image must be thought of very thoroughly, because it has to convey a lot of infos and suggest different feelings, without being sketchy or overcrowded, therefore unreadable. Kind of a "less is more" approach : less visible complexity for the most infos conveyed. So I classically started with documentation : most of the visual cues were put in the briefing, so I had a clear angle of research. Google is my friend, but I have a lot of other friends too, like 90's French "Western style" comic books for this project. 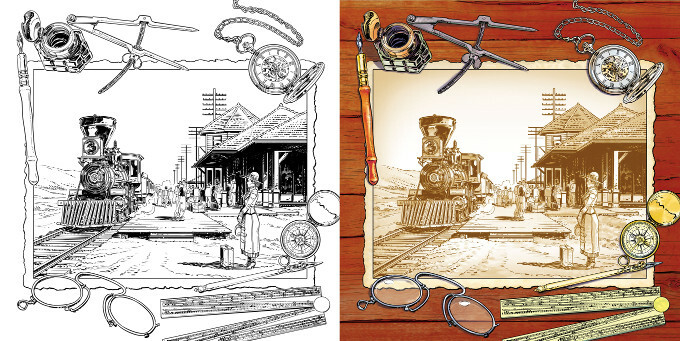 The SteamRollers graphical briefing document at a glance. Then, a lot of sketches, beginning with the main and most important illustration : the box cover. We even made a survey on Facebook to see which one of the sketched composition were the public favourite. When the composition was set, I did a colour rough, to be sure of the direction I was taking for the final colour work. And finally, was the time for the finished inking and colouring. All on computer, on my Wacom Cintiq, so the infinite number of corrections and adjustment can counterbalance my lack of innate talent. And, except for the survey part, repeat this process for almost all of the game's artwork. Was it very different from comic strips? Will you be looking forward to other such projects in the future? I sure am. It's a very exciting work for me, and I like to breathe another atmosphere than comic books'. As I said, I was hoping one day I could do boardgames artwork, so now I'm longing for the next one !